Rocket Lab has another military launch coming up. Rocket Lab's Electron booster will launch three experimental military satellites this month from New Zealand. The spaceflight startup's Electron rocket will loft three experimental satellites for the U.S. Air Force this month, company representatives announced today (April 3). The total mass of the trio is more than 397 lbs. (180 kilograms), heavier than any payload Rocket Lab has launched to date. "We're really stretching the legs of the Electron launch vehicle," Rocket Lab CEO Peter Beck told Space.com. Just last week, an Electron orbited a spacecraft called R3D2 in Rocket Lab's first mission of 2019. R3D2, which will be operated by the U.S. Defense Advanced Research Projects Agency (DARPA), aims to space-qualify a tissue-thin antenna that could improve small satellites' communications capabilities. 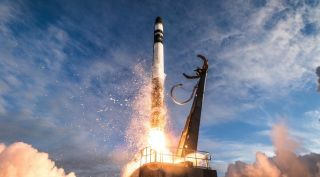 The three craft going up on the next launch — which will occur sometime this month from Rocket Lab's New Zealand site, on the North Island's Mahia Peninsula — also aim to develop and demonstrate new technologies. The Space Plug-and-Play Architecture Research Cubesat-1 (SPARC-1), for example, will test out ultraminiaturized avionics and other gear. "It's really seeing how small and functional some of this stuff can be," Beck said. The Falcon Orbital Debris Experiment (Falcon ODE), also a cubesat, will help researchers evaluate the effectiveness of ground-based efforts to track space junk, he added. And the Harbinger satellite, which makes up the bulk of the total payload mass, seeks to show that a privately built spacecraft can meet certain U.S. Department of Defense requirements, Rocket Lab representatives said. California-based Rocket Lab aims to greatly increase access to space using the 57-foot-tall (17 meters) Electron, an expendable vehicle that can carry about 500 lbs. (227 kg) to orbit on each $5 million mission. Electron has four successful satellite-lofting missions under its belt, the first of which occurred in January 2018. The rocket will soon fly much more frequently, if all goes according to plan; Rocket Lab aims to launch a dozen missions in 2019, Beck said. The company also hopes to have a second launch site, at the Mid-Atlantic Regional Spaceport in Virginia, up and running by the end of the year, he added. "We're on a pretty good trajectory," Beck said, though he stressed that the company still has a lot of work left to do. SPARC-1 is a joint US.-Swedish project sponsored by the U.S. Air Force Research Laboratory Space Vehicles Directorate. Falcon ODE is sponsored by the U.S. Air Force Academy, and Harbinger, which was built by Colorado-based company York Space Systems, is sponsored by the U.S. Army, Rocket Lab representatives said. The upcoming mission was procured by the Department of Defense's Space Test Program, in partnership with the department's Defense Innovation Unit. "We are incredibly proud that Rocket Lab has been selected by the Space Test Program to launch advanced technologies that accelerate operational space capabilities," Lars Hoffman, Rocket Lab's senior vice president of launch services, said in a statement. "We look forward to working with our mission partners to continue offering world-leading access to space."